Prolific multi-faceted American entertainer, Alec Baldwin, is the oldest and most popular of three other of his brothers in the acting business. His role as Joshua Rush in the sixth and seventh seasons of the television soap opera, Knots Landing, first earned him recognition and provided him the much-needed opportunity to feature in other television works. The movie icon is most popular for his starring role as Jack Donaghy on the TV show, 30 Rock from 2006 to 2013. His outstanding performance on the show earned him numerous awards including seven Screen Actors Guild Awards, which made him the highest SAG Award recipient among the male folk. As a matter of fact, Alec Baldwin has garnered 3 Emmy Awards, 2 Golden Globe awards, and the previously-mentioned 7 Screen Actors Guild Awards in addition to 97 nominations, throughout his over three-decade career in acting. As of February 11, 2017, Alec had served as the host of Saturday Night Live 17 times, making him the record holder for most hosting of the show. In 2016, the comic side of him was seen when he impersonated Donald Trump on October 1, 2016, during the coverage of that year’s US Presidential election. The impersonation was so good that in 2017, he won a Primetime Emmy for it. Born on April 3, 1958, in Amityville, New York, the actor was raised in Massapequa, a suburb on Long Island, New York. He played football during his time at Alfred G. Berner High School, Massapequa before moving on to George Washington University in 1976 to study political science major with the intention of becoming a legal practitioner. Along the line, his childhood love for acting was rekindled, causing him to abandon his dream of becoming a lawyer and transferring to New York University’s Tisch School of the Arts in 1979. However, he did not complete his Bachelor of Fine Arts degree in the university until 1994. While in New York University, Alec also attended an acting school, Lee Strasberg Theatre Institute and was subsequently absorbed into the Actors Studio. He began his acting career in the theater, debuting on the Broadway in the 1986 Joe Orton’s two-act play, Loot. Later on, he landed his first television role as Billy Aldrich in The Doctors; the character he portrayed from 1980 to 1982. Since then, the actor has made several appearances both on Broadway, television, and films. Alec Baldwin has been in the movie industry for more than thirty years and is, no doubt, one of the most prolific actors in the industry. He has featured in a lot of films which became successful commercially and has also hosted/co-hosted television, radio and award shows such as The Essentials, the 82nd Academy Awards, Saturday Night Live, the 2011/ 2013 NFL Honors awards show, Up Late with Alec Baldwin, and The New York Philharmonic This Week, among others. In addition to that, Alec Baldwin is also a published author. In 2013, he was listed as number 83 on Forbes Celebrity 100 Earnings with an income of $8 million that year. However, that has since increased and as a result, led to the growth of the actor’s net worth to about $65 million. The popular Hollywood actor is the first son of Carol Newcomb and Alexander Rae Baldwin Jr.’s six children, though not the first child. He has two sisters and three brothers. The eldest child of the family is a daughter named Elizabeth “Beth” Baldwin Keuchler born in 1955 while the second daughter, Ann Baldwin Sasso, was born in 1965. Alec’s three brothers, Daniel Baldwin (born in 1960), William “Billy” Baldwin (born in 1963), and Stephen Baldwin (born in 1966), are also successful actors. Although it is not an unusual occurrence for some members of a particular family to pursue the same career; it is not all the time that they all succeed at it like the Baldwin brothers. Even though they do not look exactly like each other, their facial features, including their eyes and noses, look so alike that sometimes people confuse one with another. Alec, who is the most popular among his brothers, has been married two times. His first marriage was in 1993 to actress Kim Basinger whom he met during the filming of the movie, The Marrying Man. In the film shot in 1990, Alec and Kim played the role of lovers, Charley Pearl, and Vicki Anderson respectively, and later brought their on-screen love to real life, tying the knot three years later. They welcomed a daughter named Ireland in 1995 and by 2000, their relationship had already become so sour that they got separated. Two years later, their union was officially dissolved. This was followed by a seven-year-long custody battle. 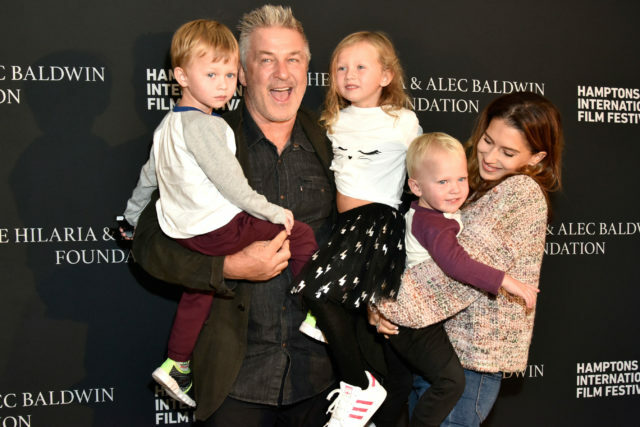 About nine years after his divorce from his first wife, Alec Baldwin decided to move on. He met a lady, Hilaria Thomas, who works with Yoga Vida in Manhattan as a yoga instructor and they started dating in August 2011. By April of the following year, Alec popped the question and Hilaria, who is 25 years his junior, said yes. Without wasting time, they got married three months later precisely on June 30, 2012, at Old St. Patrick’s, New York City. The couple has remained married since then and now has four children together. Their first child, a daughter named Carmen, was born on August 23, 2013. Later on, their sons, Rafael, Leonardo, and Romeo, followed on June 17, 2015, September 2016, and May 2018 respectively. The amazing actor measures 183 cm (6 feet) in height and has a weight of 80 kg (176 lbs). He also has blue eyes and blond hair. Alec’s body measurement is as follows: chest- 42 Inches, waist: 34 Inches, biceps: 16 Inches.